My family loves stir-frys. And I really appreciate how quickly they come together. However, some days I feel like using one pan for rice and another pan for the stir-fry is one pan too many when it comes time to clean up. It’s not because I am lazy… oh who am I kidding? It’s totally because I am lazy! 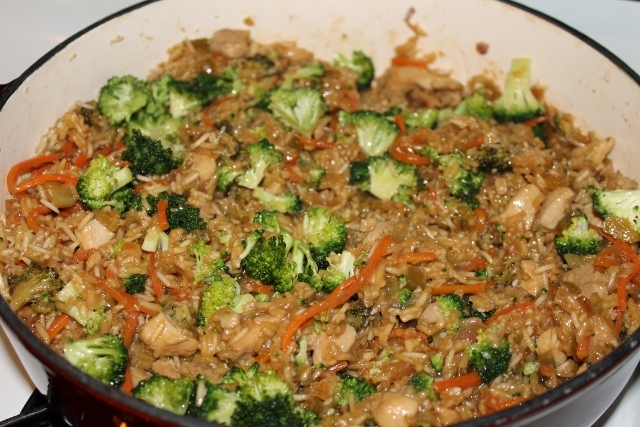 This recipe combines our favorite Asian flavors in one easy skillet dish. I used white basmati rice, which cooks in about 20 minutes. If you use a different rice, use one with a similar cooking time. The recipe calls for chicken broth. I make chicken broth in a slow cooker to stretch my grocery budget a little further. If you do not have chicken broth, you can substitute vegetable broth or water. I added sesame seeds to this recipe. I save money on sesame seeds by buying them from the bulk section of our grocery store. I can buy a pound of sesame seeds for less than the price of a bottle of seeds in the spice section. Brown chicken in a large skillet with a lid. While the chicken is browning, mix the vinegar, oil, soy sauce, honey, and ginger together in a small bowl. Add the rest of the veggies, except for the broccoli. Add the rice, sesame seeds, sauce, and broth. Cook over a medium-high flame until it reaches a boil. Lower flame, place lid on pan and simmer for 15 minutes. Add broccoli and simmer for an additional 5 minutes or until liquid is cooked off. I like to serve this on a bed of greens. 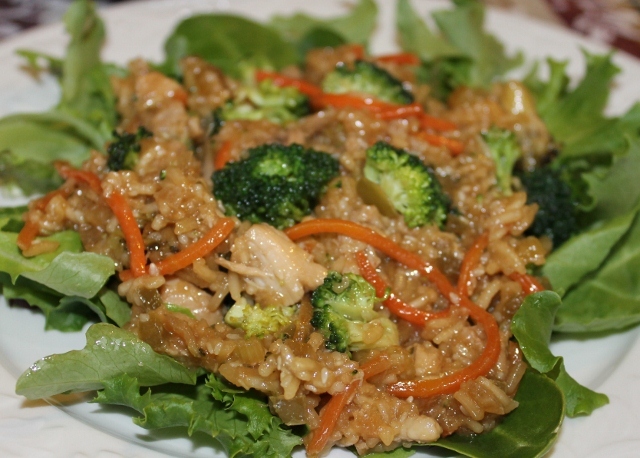 The sauce from the Asian Chicken Skillet drips down and serves as a dressing for the greens. Do you think I could adapt this recipe to chicken that is already cooked and cut in bite size pieces? I often make chicken broth and use up all the broth before I use up the chicken. Being dairy free, it is hard to find recipes that call for cut-up cooked chicken. A friend of mine said that her mother fed her family when her dad was in law school by cooking a turkey once a month and then making many casseroles, etc. for the rest of the month with the leftovers. I love to make turkey and then make a large batch of Turkey Frame soup but I still have at least 3 cups of leftover turkey. I don’t know what to do with it. You could definitely use cooked chicken in this recipe. Skip the first step and add it in with the broccoli, 5 minutes before the dish is done. I tend to cook up rice in fairly big batches– it freezes nicely (and flat!) in zip loc bags, which in turn thatw QUICKLY in warm water and you can stir the rice right into any stir fry right at the end! How much honey or sugar do you need? It just says 1/4. Can you use brown rice in this recipe? Is the rice already cooked? No, the rice is not cooked. 1/2 cup of soy sauce?? I buy the low-sodium sauce, and that is still 1/4 of your daily sodium per day – per Tablespoon. Do you have a suggestion for another seasoning that would be tasty, but way less sodium? Let me first say this was a very pretty dish & smelled amazing. However, we found the flavors to be way, way too strong…and my family loves bold flavors. In the future I think I would halve the soy and ginger and add a little more broth so there would still be enough liquid. I also would suggest simmering for 20-25 minutes rather than 15 for a bit softer rice.